What’s new on phase 2? 5G will be instrumental in digitising the traditional industry as it races for better productivity and competitiveness. Creating synergies across verticals, lowering individual costs via network slicing, and cost-sharing on infrastructure deployment and service operations are all possible with 5G. Leading vertical industrials are involved from the beginning of the 5G standardisation process. Phase 2 projects are dedicated to an industrial sector or target applications for various verticals. Obviously, 5GCAR is THE phase 2 project dedicated to the automotive industry. Develop an overall 5G system architecture providing optimized end-to-end V2X network connectivity for highly reliable and low-latency V2X services, which supports security and privacy, manages quality-of-service and provides traffic flow management in a multi-RAT and multi-link V2X communication system. Interworking of multi-RATs that allows embedding existing communication solutions and novel 5G V2X solutions. Develop an efficient, secure and scalable sidelink interface for low-latency, high-reliability V2X communications. 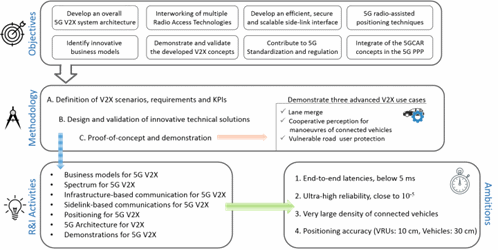 Propose 5G radio-assisted positioning techniques for both vulnerable road users and vehicles to increase the availability of very accurate localization. Identify business models and spectrum usage alternatives that support a wide range of 5G V2X services. Demonstrate and validate the developed concepts and evaluate the quantitative benefits of 5G V2X solutions using automated driving scenarios in test sites. Zero automation. Drivers continuously perform all dynamic driving tasks. Driving assistance. Drivers monitor and intervene in all driving tasks; an individual task is automated by an assistance system, such as acceleration, automatic braking or adaptive cruise control. Partial automation. Drivers intervene in all driving tasks; multiple driving tasks are automated, such as traffic jam assist, adaptive cruise control and lane monitoring for the control of steering and speed. Conditional automation. Drivers can hand over the situation-monitoring and dynamic driving tasks to an automated system, only responding to a request when the car recognises its performance limit, such as highway or intersection autopilot. High automation. Drivers can fully handover the situation-monitoring and dynamic driving tasks to an automated system in certain driving cases, such as automated urban driving. Full automation. Cars perform all dynamic driving tasks in all driving cases as if a human. Note that these six levels do not imply any particular sequence of market introduction, nor a linear progression on a step-by-step basis. Only Tesla Motors currently provides a self-driving vehicle (as of late 2016). Some forerunners have already introduced several features of level 3 driving by 2016. For all others, the timeline is not before 2021. Autonomous cars adoption will be driven by an increase in urbanisation. This market will also benefit significantly from different regulations around the world promoting greater road safety. However, many issues remain unsolved: Who will pay the extra costs for both the car and the infrastructure? Who will be responsible in case of an accident? On top of that, adoption is not guaranteed: 96% of people still want to have a steering wheel plus accelerator (gas) and brake pedals available even if their vehicles were self-driving. Recent trial: In January 2017, Orange, Ericsson, Qualcomm and PSA Group signed a partnership agreement to drive 5G technology for automotive applications, focused on “Vehicle-to-Vehicle” (V2V) and “Vehicle-to-Everything” (V2X) architecture. Initial tests will use an end-to-end architecture system based on LTE technology before evolving to LTE-Vehicle and 5G technologies. 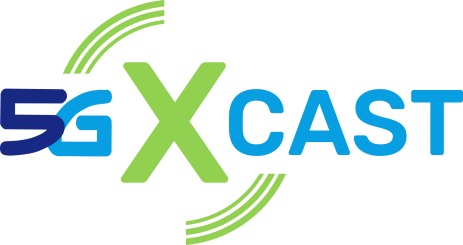 5G-Xcast is focused on Broadcast and Multicast Communications Enablers for 5G Systems. It will devise, assess and demonstrate a conceptually novel and forward-looking 5G network architecture for large scale immersive media delivery. The concept of VR is one the media and entertainment’s main issues. It has existed for many years, but recent technological advances in miniaturisation of electronic equipment and components have accelerated research and development of VR technology. For both VR and MR, the user experience is fundamental to the success of this market. The VR market faces many challenges in the short term. The four sides of the VR market, and by extension that of MR, are (a) powerful processing and rendering device, (b) headset, (c) digital distribution platform, and (d) catalogue of content (games and/or videos). They all have different life cycles, must rely on different partnerships, and have their own yet overlapping business models. Recent trial: In April 2017, Finnish operator Elisa and Nokia announced the completion of a European test of pre-standard 5G technology using the 3.5GHz band. In a joint press release, the companies said the trial, held in Rusko, Finland, achieved speeds multiple times higher than commercial 4G networks. At its peak, data speeds reached 1.5Gb/s with a minimum recorded latency of 1.5 milliseconds. The trial was a continuation of 5G testing carried out in 2016, when the pair tested the remote control of robots and 360-degree video streaming. 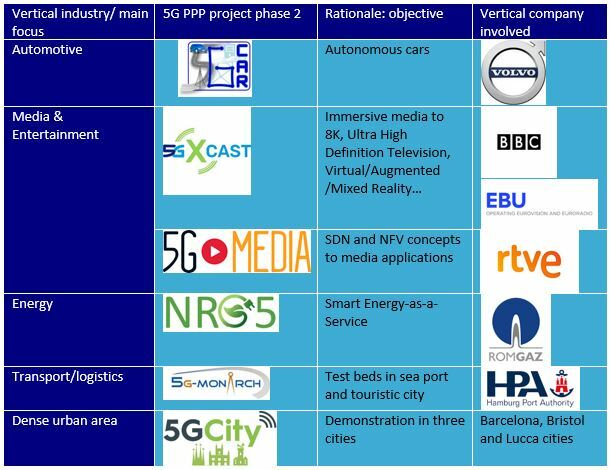 5G Media aims at investigating how these applications and underlying 5G networks should be coupled and interwork to the benefit of both: to ensure the applications allocate the resources they need to deliver high quality of experience and so that the network is not overwhelmed by media traffic.SDN and NFV are key enablers in the transformation of telco networks, bringing automation. The two independent concepts are often complementary. Upgrade functions simply and instantly. The NRG-5 project is THE phase 2 project dedicated to energy utilities. It will deliver a compliant, decentralized, secure and resilient framework, with highly availability, able to homogeneously model and virtualize multi-homed, static or moving, hardware constrained (smart energy) devices, edge computing resources and elastic virtualized services over communications’ and energy utilities’ infrastructures. 5GCITY is THE phase 2 project dedicated to cities. The ultimate goal of 5GCity is to maximize the return on investment for the whole digital market chain (users, application, cloud providers, i.e., the municipalities themselves, telecom providers, and infrastructure providers). To do so, 5GCity’s main aim is to build and deploy a common, multi-tenant, open platform that extends the (centralized) cloud model to the extreme edge of the network, with a demonstration in three different cities (Barcelona, Bristol and Lucca), and thus advance the state of the art to solve the main open research challenges in the 5G-based edge virtualization domain, including the neutral host perspective in dense deployment environments such as cities. Thus, 5GCity will design, develop, deploy and demonstrate, in operational conditions, a distributed cloud and radio platform for municipalities and infrastructure owners acting as 5G neutral hosts. Recent trial: In March 2017, TIM disclosed its plans to turn Turin into Italy’s first 5G city. To get the project underway, TIM has signed a memorandum of understanding (MoU) with the municipality of Turin. TIM plans to begin conducting 5G technology trials in 2018. The first will involve 3,000 users, who will be able to access an array of smart city services over the new network. 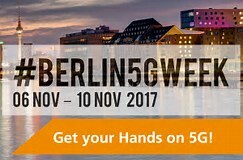 Many 5G PPP projects @Berlin 5G Week! Getting digital infrastructure ready for 5G! ONE-5G, 5G-XCast and 5G-Transformer. 5G-CORAL as complementary 5G project will also be there. One5G and 5G-Xcast are co-organizing a joint workshop on cm-wave and mm-wave based communications for 5G Networks (CmMmW5G). 5G-TRANSFORMER co-organises the First Workshop of COntrol and Management of network slices for VERTicals (COMVERT). At last, 5G-CORAL co-organises the First International Workshop on Edge and Fog Systems for 5G & Beyond (IWEF).